IBM® DB2® 12 for z/OS® delivers key innovations that increase availability, reliability, scalability, and security for your business-critical information. In addition, DB2 12 for z/OS offers performance and functional improvements for both transactional and analytical workloads and makes installation and migration simpler and faster. DB2 12 for z/OS also allows you to develop applications for the cloud and mobile devices by providing self-provisioning, multitenancy, and self-managing capabilities in an agile development environment. DB2 12 for z/OS is also the first version of DB2 built for continuous delivery. 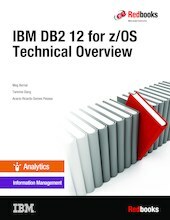 This IBM Redbooks® publication introduces the enhancements made available with DB2 12 for z/OS. The contents help database administrators to understand the new functions and performance enhancements, to plan for ways to use the key new capabilities, and to justify the investment in installing or migrating to DB2 12.